Note: Only one Processing Area can been used. It is recommended to include areas covered by images in the Processing Area, so as to exclude areas of low overlap that can affect the results. The Processing Area affects only the visualization of the Automatic Tie Points in the 3D View of the rayCloud. It does not affect the results of step 1. Initial Processing. When the Processing Area is defined before step 2. Point Cloud and Mesh is processed, it affects the Point Cloud visualized in the 3D View of the rayCloud and the results saved on disk. This Processing Area will also affect the results of step 3. DSM, Orthomosaic and Index. When the Processing Area is defined after step 2. Point Cloud and Mesh is completed, it only affects the Point Cloud visualized in the 3D View of the rayCloud but not the results saved on disk. This Processing Area will also affect the results of step 3. DSM, Orthomosaic and Index. When exporting the Point Cloud, it is possible to take into account the Processing Area, even if it is drawn after step 2. Point Cloud and Mesh is processed. For more information about how to export the Point Cloud: How to export the Point Cloud. When the Processing Area is defined before step 3. DSM, Orthomosaic and Index is completed, only the results of step 3 will be affected. 2. In 2. Point Cloud and Mesh, select the Advanced box. 3. 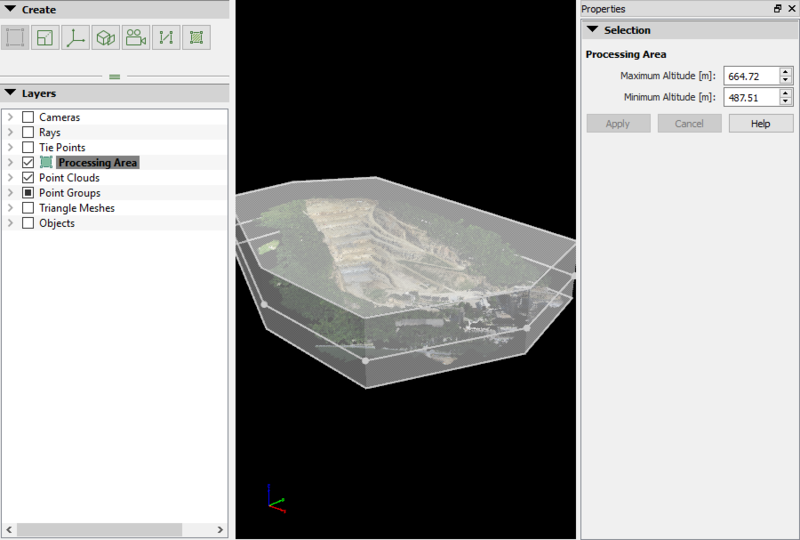 On the Advanced tab, in the Point Cloud Filters section, select the Use Processing Area check box. The Processing Area will be taken into account for the results of step 3. DSM, Orthomosaic and Index even if the Processing Areas box is not selected in the Point Cloud Filters: Menu Process > Processing Options... > 2. Point Cloud and Mesh > Advanced. Access: It is possible to draw the Processing Area in the Map View before or after the project is processed. It is possible to draw the Processing Area in the Map View only if the project has image geolocation or GCPs. 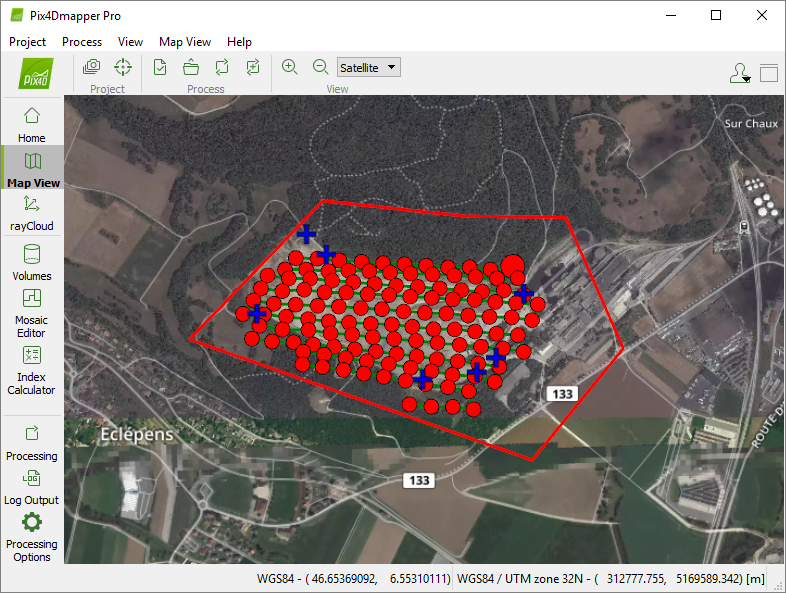 It is not possible to draw the Processing Area in the Map View or import it as a *.shp, *.kml or *.dxf file if the image geolocation / GCP or Output Coordinate System is arbitrary. To create a Processing Area for a project with an arbitrary coordinate system step 1. Initial Processing has to be completed. 1. On the Menu bar, click View > Map View. 2. On the Menu bar, click Map View > Processing Area > Draw. 3. On the pop-up window that appears with information about how to draw the Point Cloud Densification area, click OK.
4. Left click to start drawing. Move your mouse to the next point of your polygon and left click to add a point to the polygon. 5. 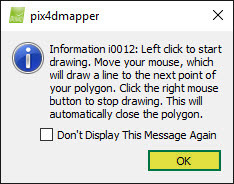 Click the right mouse button to close the polygon and stop drawing. Access: In order to draw a Processing Area in the rayCloud, step 1. Initial Processing has to be completed. 2. On the left sidebar, in the Create section, click to draw a Processing Area. 3. On the 3D View, left click to mark the vertices of the Processing Area. At each click, a vertex is created and the Processing Area is formed. 4. Right click to add the last vertex and to create the Processing Area. The area is created and displayed in the 3D View. Only points within the area are displayed. Objects as well as GCPs and Manual Tie Points are displayed even if they lie outside the area. 5. (optional) Edit the Processing Area following: How to edit a Processing Area in the rayCloud. 6. Save the changes in the rayCloud View: In the Menu bar, click Project > Save Project. 2. On the Menu bar, click View > Map View. 4. On the Select file pop-up, navigate to the file. It is possible to import *.shp and *.kml files.